How to Reach: Andaman can be reached by taking a flight from major metro cities like Chennai, Calcutta and Vizag. The one name that sends chills down the spine even today is that of Kala Pani Jail, located in Andaman. The jail still has the fear element in the air and anyone visiting the place can sense the pain the inmates went through back during the time this jail was functional. 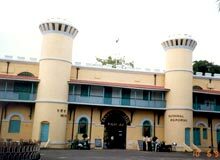 The British undertook the construction of the Cellular Jail and would send "dangerous" criminals from India to this place to undergo torturous treatments. The Andaman Island was used to house prisoners way back in the year 1857. The Cellular Jail of Andaman Island is now a protected monument and stands as a testimony to the torture meted out to the helpless prisoners. The Cellular Jail housed many famous rebels and freedom fighters. These included well-known figures like Bhagat Singh, Sukh Dev, Rajguru, Batukeshwar Dutt, Bejoy Kumar Sinha, Shiv Verma, Jaidev Kapoor, Dr. Gaya Prasad, Kamal Nath Tiwari and Mahabir Singh. Prisoners from Burma were also sent over here. These people were imprisoned in the islands since they were cut off from the mainland and were also used as laborers for constructing buildings and doing harsh manual labor. There were seven wings in the building and all of them were scrutinized from a central watchtower. There was a large bell in the watchtower that was rung in case of any emergency. Each wing had three stories and a total of 698 cells. Each cell measured 4.5 meters x 2.7 meters and had a ventilator fixed at a height of 3 meters. The prison is called Cellular Jail because of the fact that the cells were placed in a way that it did not allow inmates to communicate with each other.